I guess this might be bento #22. I really think it's further along, maybe 25 or 26. This Monday was boring because we had just gotten home and I had no groceries, so the boy took goldfish & a cheese stick. I really think there were 1 or 2 bentos from before Christmas, but I cannot find the pictures! The boy had banana nut mini-muffins and diced canteloupe with picks, his choice. Nothing fancy, but we're still playing "get settled back home from vacation" so I'll take easy any day! 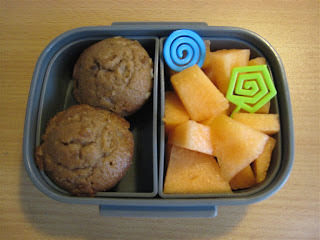 Yay for easy muffin lunches :D Muffins are one of my favorite go-to's for bento! Where do you purchase the picks you use? I just ordered a bento box for my toddler son and want to get some cute picks that aren't too sharp. Thanks!